London: Henry Colburn, 1838. 434 pages with colored titlepage. Cloth. Very good-.. 1st Edition. Hard Cover. Very Good-. 8vo - over 7¾" - 9¾" tall. New York: Thames and Hudson, 1992. 160 pages with very many colour photos. 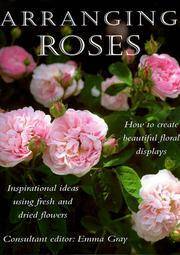 "History of an Obsession, decorative roses, Still Lifes with Roses, Garden Roses, Rooms with Roses". 1st Edition. Hard Cover. Very Good/Very Good. 4to - over 9¾" - 12" tall. New York: Harper & Row, 1988. 172 pages with some colour photos and diagrams. Cltoh with dust jacket.. 1st Edition. Hard Cover. As New/As New. 4to - over 9¾" - 12" tall. Ortho Books, 1992. 352 pages with very many colour photos. Cloth with dust jacket.. 1st Edition. Hard Cover. Very Good/Very Good. 4to - over 9¾" - 12" tall. Impressionist Roses. Bringing the Romance o f the Impressionist Style to Your Garden. New York: Metro Books, 2001. 140 pages with very many colour photos. Cloth with dust jacket.. 2nd Printing. Hard Cover. As New/As New. 4to - over 9¾" - 12" tall. U.S.A.: Timber Press, Incorporated, 2006. 304 pags with hundreds of colour photos. Cloth with dust jacket.. 1st Edition. Hard Cover. As New/As New. 4to - over 9¾" - 12" tall. Sydney: Australian Women's Weekly Garden Guide, 1995. 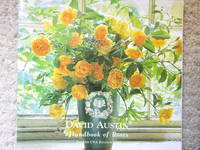 128 pages with very many colour photos. Paperback.. 1st Edition. Soft Cover. Very Good. 4to - over 9¾" - 12" tall. Austin, 2003. 62 pages with very many color photos. Staple-bound.. 4th Us Edition. Soft Cover. Very Good. 8vo. 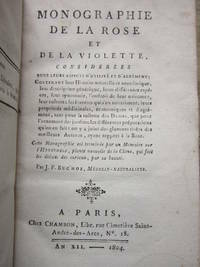 Paris: Chez Chambon, 1804. considerees sous aspects s'utilite et d'agrement contenant leur historire naturelle et anecdotique, leur description generique, eur differentes especes, leur synonimie, l'endroit de leir naissance, leur culture .... 272 pages. Quarter calf with marbled boards (extremeties are rubbed - hinges and joints are strong as is inside binding).. 1st Edition. Hard Cover. Very Good-. 8vo. London: Journal Royal Horticultural Society, 1934. 7 pages article (plus 4 b/w plates) in the 1934 Journal Royal Horticultural Society. Paperback.. 1st Edition. Soft Cover. Very Good. 8vo. U.S.A.: Henry Holt & Co, 1991. 106 pages with many colout photos. Cloth w.dj.. 1st Edition. Hard Cover. Very Good/Very Good. 4to - over 9¾" - 12" tall. U.S.A.: Metro Books, 1997. 4to. 160 pages with many colour photos. Cloth w.dj.. 1st Edition. Hard Cover. Very Good/Very Good. 4to - over 9¾" - 12" tall. U.S.A.: Trafalgar Square Pub, 1995. 114 pages. Paperback.. 1st Edition. Soft Cover. Very Good. 4to - over 9¾" - 12" tall. New York: Moore, 1858. 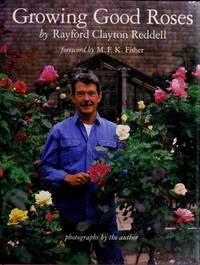 The American Rose Culturist; being a Practical Treatise on the Propagation, Cultivation and Management of the Rose in all seasons, with a list of choice and approved varieties, adapted to the climate of the United States. To which are added full Directions for the Treatment of the Dahlia. 3rd ed. NY 1859. 8vo. 96 pages. 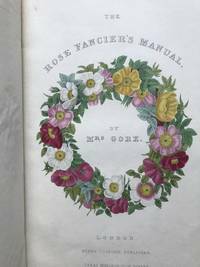 Bound with: Louisa Johnson "Every Lady Her Own Flower Gardener, addressed to the Industrious and Economical. 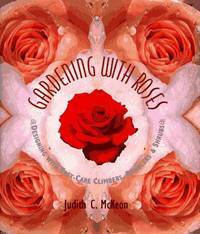 Simple and practical directions for cultivating plants and flowers in the garden and in rooms." NY 1958. 119 pages. Brown cloth.. 3rd Printing. Hard Cover. Very Good. 12mo - over 6¾" - 7¾" tall. Washignton, DC: USDA, 1922. 14 pages with a few b/ illustrations. Staple-bound.. 1st Edition. Soft Cover. Very Good-. 8vo - over 7¾" - 9¾" tall. 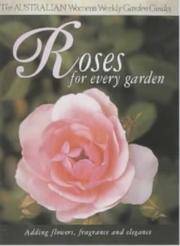 Harrisburg, PA: American Rose Society, 1944. 234 pages with photos. Brown cloth. Very good condition.. 1st Edition. Hard Cover. Very Good. 8vo - over 7¾" - 9¾" tall. Rose Society of Ontario, 1954. 156 pages. Green wrappers. Very good.. 1st Edition. Soft Cover. Very Good. 8vo - over 7¾" - 9¾" tall. Shreveport, 1980. 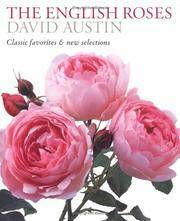 11 volumes of the American Rose Annual 1980-1990. All softbound 8vo. About 200 pages each. Extra shipping will apply.. 1st Edition. Soft Cover. Very Good. 8vo - over 7¾" - 9¾" tall. Boston, MA: Charles T. Branford, 1949. Slim 8vo. 46 pages. Quarter-cloth.. 1st Edition. Hard Cover. Very Good-. 8vo - over 7¾" - 9¾" tall.